After an iconic run, the entry-level Ferrari California is being phased out to pave way for their newest model, the Ferrari Portofino, a car named after a picturesque fishing village in southern Italy. Pricing will be announced at the Frankfurt Motor Show next month, but initial expectations have it just over $200,000, replacing the California as the least expensive model in the Ferrari family. The new convertible will come with a 552 horsepower turbocharged V8, and the company claims it will have better responsiveness and fuel economy than the California T's engine. Ferrari claims the iconic snarl has been tweaked so it sounds better with the top down. The body is a bit lighter and stiffer to improve cornering and the top speed has been bumped up. It will retain the two back seats and folding hard roof from the California, with a new design that offers a bit more legroom in the back. A new wind deflector will help to control cabin airflow when the top is down. The California model was first used on a version of the Ferrari 250 GT in the late 50s for a few wealthy America enthusiasts. The decision to introduce a front-engine V8 model was taken on a few years ago by some who found the mid-engine F430 too compromised for daily driving compared to its front engine rivals. 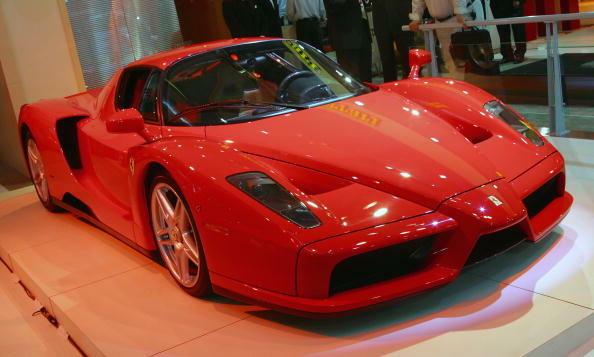 The car marked a split in the Ferrari family, with the California and Scaglietti as prestige GTs, and the F430, Scuderia, 599 GTB, and Enzo replacement as the extreme sports cars. The California was tuned to be dramatically different than any other Ferrari. It was the first V8 with a front mounted engine. It was aimed at first-time Ferrari customers to compete with Mercedes SL models and the Aston Martin DB9, with a higher number of cars being annually produced. Back in 2008, the California name hadn't been seen for 40 years, but Ferrari had many convertibles in the meantime, including the F430 and 458 Spiders and the bold F50. The Portofino marks a new chapter in the long history of Ferrari's iconic sports convertibles.